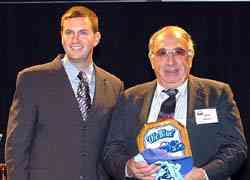 Being honored at a racing banquet is nothing new for Tony Hirschman. This year, he is on his fifth NASCAR Modified Tour championship. 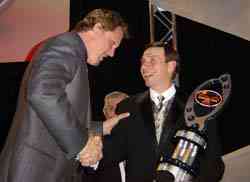 Before anyone set foot on the grounds of the Mohegan Sun Resort in Connecticut, where this weekend’s NASCAR Modified Tour banquet was held, Hirschman had already been feted at Champions Week in New York City and the New Hampshire International Speedway banquet one week ago thanks to his 2005 accomplishments. 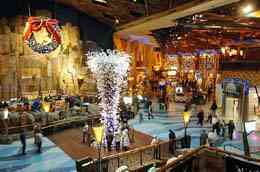 But the biggest gathering of all for Hirschman was the Tour banquet, which is second in attendance of all NASCAR banquets to only Nextel Cup. That’s right, there were more people toasting Hirschman at Mohegan Sun than Martin Truex, Jr. at the Busch Series banquet, Ted Musgrave at the Craftsman Truck Series banquet or in any of the formal events for NASCAR’s other divisions. Guests at Friday night’s banquet also proved that once you are a Mod fan, you are always a Mod fan. Former Modified aces Jerry Cook, Geoff Bodine and Steve Park were in attendance. This year’s Tour banquet was especially sweet for Hirschman for several reasons. Hirschman showed that he could be fast and consistent by winning the Bud Pole award for being the fastest qualifier the most times this season. Hirschman showed that family matters. His wife Brenda was by his side at all three banquets this winter and his two sons shared in the glory at Mohegan Sun thanks to their important jobs on the #48 team. Matt [who also raced against his father in seven Tour races this year] is the team’s co-crew chief and Tony, Jr. is the spotter. And possibly most important, Hirschman showed that being nice to the fans matters. For the first time in his career, he received the Speed51.com Modified Tour Most Popular Driver award. It was the first time that fans were able to vote online to determine the winner. When Speed51.com’s Bob Dillner introduced Hirschman as the winner, the normally buttoned-down and low-key racing veteran turned downright giddy. His family was honored as well. “He’s the star player of this team, one of the greatest Modified drivers ever and now the Most Popular Driver,” said a proud Matt Hirschman. In winning his five titles, Hirschman has driven for three teams – the legendary Boehler Racing Enterprises, the now-defunct #25 team that was owned by Gary Cretty and the #48 team owned by the Kehley family of New York that has taken him to the last two consecutive championships. Hirschman was the big winner, but not the only person who was honored during the evening. The theme of the night might have been the fact that even though it was a formal event, it wasn’t a scripted one. Every winner showed their true colors instead of merely reading a prepared speech and sounding like a robot. And for some, just getting through the speech was a challenge. Championship runner-up Ted Christopher was spied earlier in the day reaching into his pocket to practice his speech before realizing that he brought with him the one that he recited in 2004 by mistake. Rookie of the Year Tyler Haydt, who told Speed51.com that he had never been to a race banquet at a venue larger than a local firehouse before, accidentally left out a paragraph of his speech and didn’t even realize it until sitting back down. He did manage to remember the biggest thing and thank his Mom though. At least they did better than Steve Whitt. The New Jersey driver had a breakthrough season in 2005 and winning the Driver Achievement Award came as a complete surprise to him. When the award was announced, Whitt was nowhere to be found. He attended the banquet, but had made his way to the restroom when his name was called. Old friends were remembered during the evening. The late Tom Baldwin might be gone, but he is not forgotten. Longtime friend Walter Newcomb won the Smiley Waterman Award presented by the Modified Tour Auxiliary and he remembered back to one of Baldwin’s biggest banquet prizes. 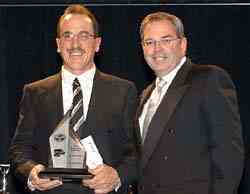 Baldwin was also remembered with the presentation of the Tom Baldwin Award that went to hard charger Ted Christopher. Even though TC has been in just about every situation at a racetrack throughout the years and rarely shows emotion, he was visibly moved when accepting the award. 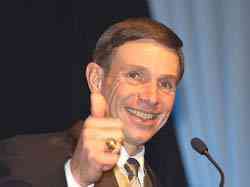 NASCAR’s Don Hawk thought that it was especially fitting for Christopher to win. Like Baldwin, the Ferrante family is a big part of Modified history on Long Island. After decades of competition, the family is planning to scale back or stop racing altogether in 2006. Team owner Tony Ferrante and driver Tony Ferrante, Jr. was honored at the banquet with both the NASCAR Dedication Award and the Len Boehler Car Owner Award. Mike Boehler presented the car owner award in the name of his late father. ”He’s been a car owner for 40 years and he made the #3 famous on Long Island,” said Boehler of Ferrante, Sr.. The award was even more special to Ferrante, who received a standing ovation. The night had a little bit of business thrown in also. NASCAR’s Don Hawk addressed the guests to bring them up to speed on developments with the Tour. as a title sponsor, was a successful one with 75 teams attempting to qualify for at least one event, which was the second highest tally of all NASCAR Touring divisions. He told teams that Brett Bodine and the staff of the NASCAR Research and Development Center in Concord, North Carolina is hard at work working on changes to cut costs in the division, he said the a schedule was not quite ready yet but would be released soon and he confirmed that NASCAR is trying to get television coverage of the Modified Tour as part of the 2007 television contracts. Hawk also looked forward to the future. That season is likely to start in April with the Icebreaker at Thompson International Speedway. Speed51.com will bring you all of the news from the Modified Tour throughout the off-season. Len Boehler Car Owner Award - Tony Ferrante Sr.
NASCAR Dedication Award - Tony Ferrante Sr. and Jr.